It’s asparagus season in Germany, so I’ve been making a point of eating a lot of asparagus while I still can. While in the rest of the world, everyone seems to be eating green asparagus, the Germans are busy chowing down white asparagus with boiled potatoes and sauce hollandaise. I’ll bring my favorite white asparagus recipe soon (which no longer includes sauce hollandaise), but today I’d like to share with you my favorite way of eating green asparagus. I obtained this recipe from Daniela, who was kind enough to share it with me. 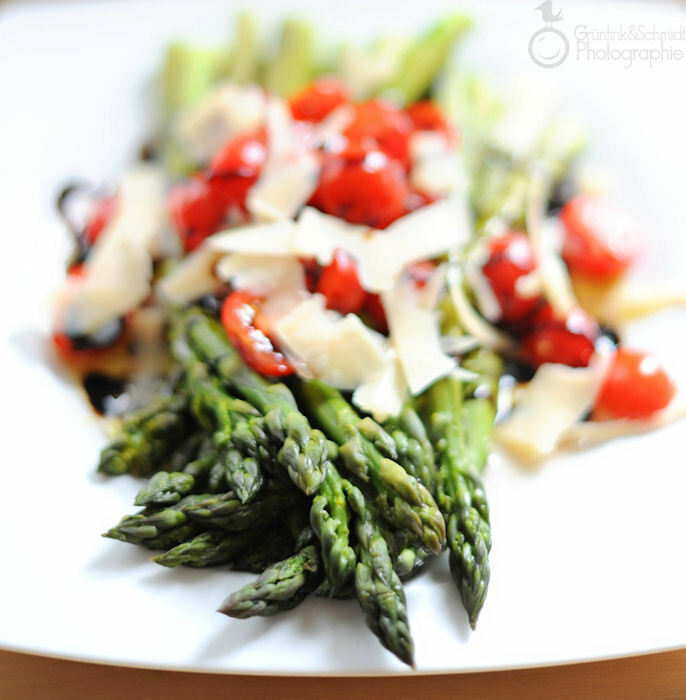 I had never eaten green asparagus before I tried her recipe and it absolutely won me over. When she sent the recipe, she wrote that she had eaten something similar at an Italian restaurant. She commented “you don’t have to peel green asparagus, isn’t that great”? Yes, Daniela, it’s amazing! White asparagus has to be peeled, and if you have many very thin stems, it can take quite some time. It’s a pain to peel white asparagus. I’ve more than once almost lost a finger in the process. 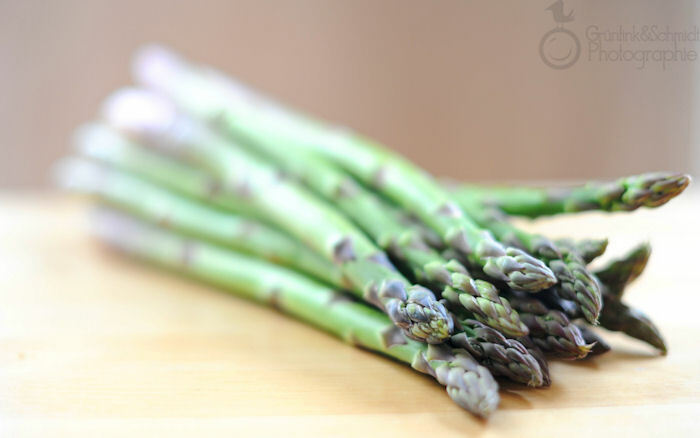 Green asparagus is so easy, not just in comparison! You just cut off the white-ish stems and off you go. It takes a minute, so fantastic! By the way, I make the recipe below just for myself. My friend David, for whom I made this dish two weeks ago, said he thought it was a huge portion of fiber and that he usually never eats that many vegetables in one sitting. He loved the dish, and he enjoyed eating all the vegetables. Lucky for me, my husband is no fan of green asparagus, or white asparagus. So I get to eat asparagus by myself all the time and don’t even have to share just one bit! And while asparagus tends to be a bit of a pricier vegetable, I do indulge. As my husband constantly reminds me: I don’t eat expensive things such as big chucks of beef or caviar. This means: you can definitely split this portion with someone (or offer this as an appetizer at a party), but why would you? I encourage you to make this salad for yourself. It will make a bad day all better, I promise! Also, you can make this dish in a vegan version. Just leave out the parmigiano, you won’t miss a thing, I’ve had this dish without cheese before and it’s still really really good! 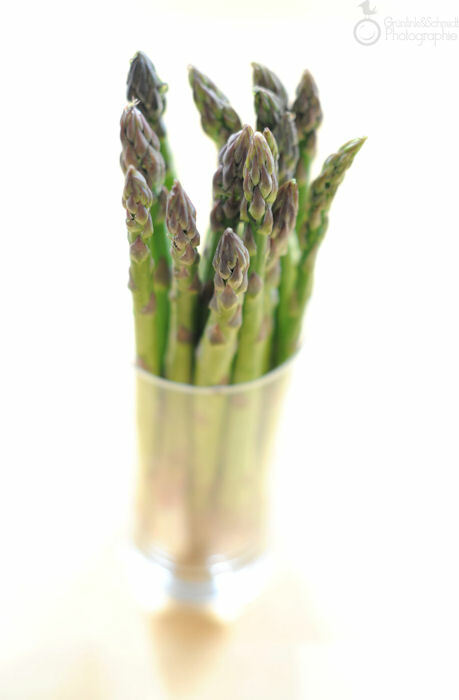 Cut the stems off the green asparagus and wash them well. 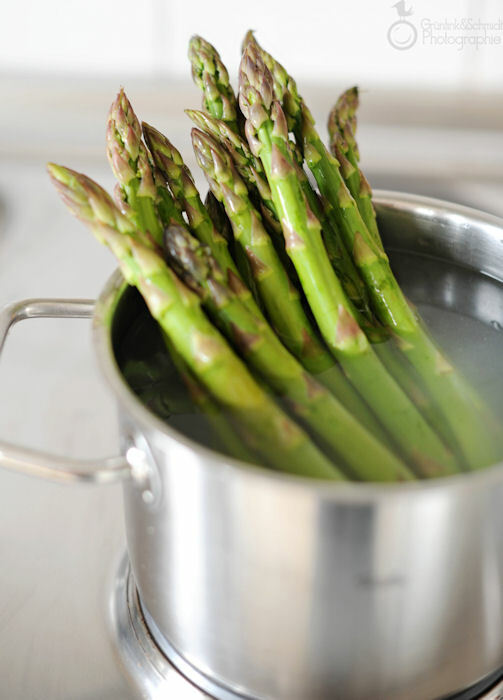 Place water in a pot and place the asparagus into the pot, ideally stems up (you just want to steam them, not boil them). Drain when done and carefully place onto a large plate, ensuring not to break the stems. While the asparagus is boiling, wash the cherry tomatoes, and halve them (taking out the green part in the middle of the upper half as it’s no fun to eat). In a bowl, mix the lemon juice, the olive oil, the sugar, the salt and the pepper. 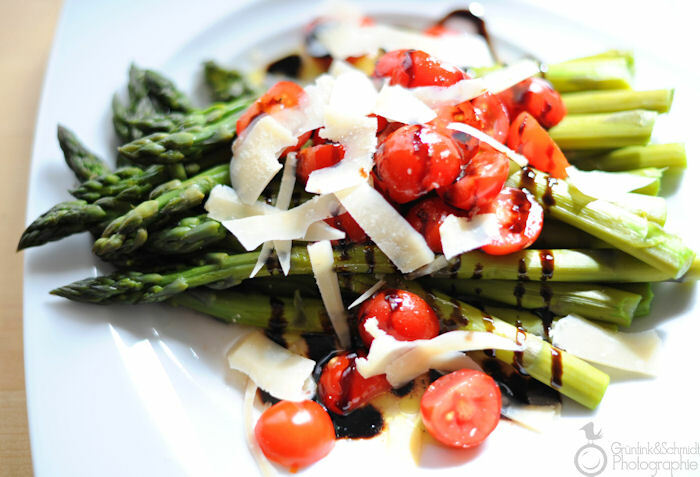 Spread the cherry tomatoes over the asparagus; sprinkle the dressing over the tomatoes and the green asparagus. Using a knife, grate some parmiggiano over the vegetables in wide, thin slices. Then decorate with cream of balsamic. Wonderful new-aged salad idea! 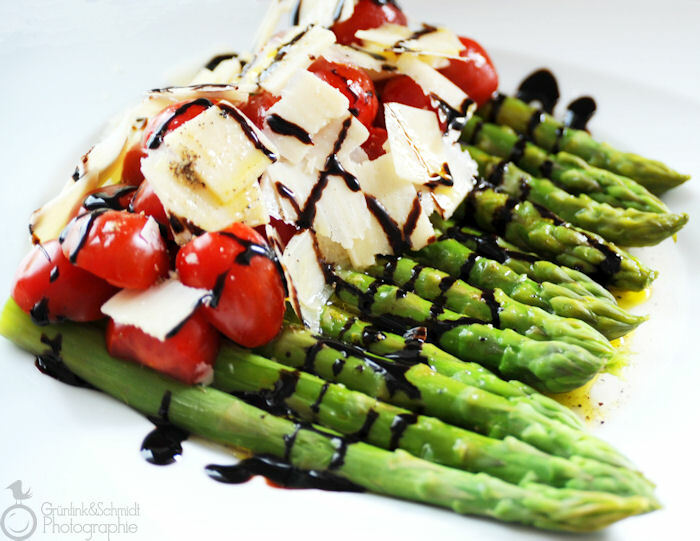 I’m a huge asparagus and tomato fan (oh and cheese of course). Must try this one.